And with my diet of spicy Asian food, I’m always wanting a floral, nutty, creamy dessert to end the meal. Indian sweet and ice cream flavors tend to be with nuts like pistachios or cashews, rosewater, cardamon or fruity with mango or chikoo, which tastes like a cinnamony pear to me. They also sort of border on Middle Eastern flavors with cinnamon, orange blossom, honey and sometimes fig like I’ve seen in Tamil Nadu. And like Americans, they incorporate their drinks into ice creams, with falooda and chai flavors. Apna Bazaar has a delightful ice cream bar with flavors such as butterscotch, royal saffron, rose petal or malai (an Indian sweet flavor). They also have a variety of syrups and toppings if you are so inclined. These flavors are great for a sunny day sitting on their patio outside or inside a room that is designated the Bollywood theater. Both are great options, and though this is a popular spot for NRI’s and white Americans, there is always somewhere to sit and amazing food to be enjoyed. Along with a tasty meal menu, Apna Bazaar offers many different kinds of Indian sweets and fried snacks that are available to take home. 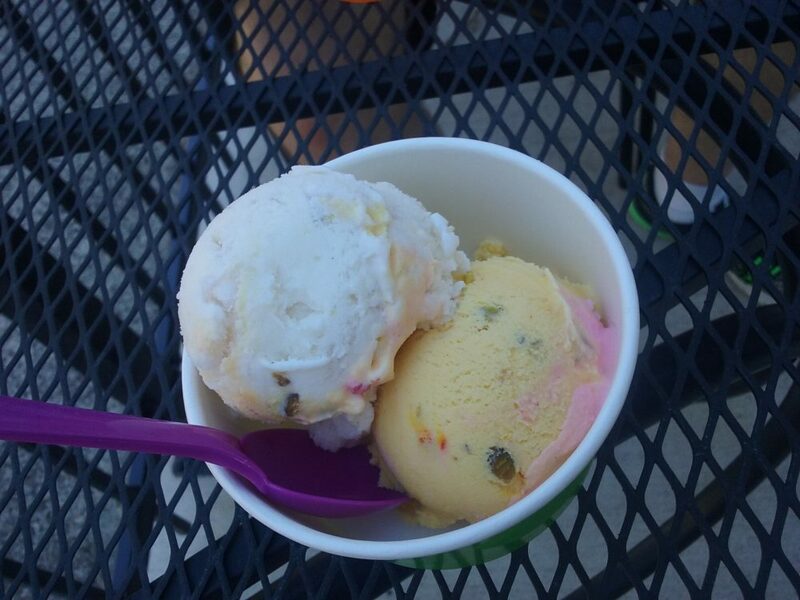 The ice cream is included in this experience, where they can scoop a pint out for you by weight, or you can peruse the back aisles for a $20 tub with the same flavors.